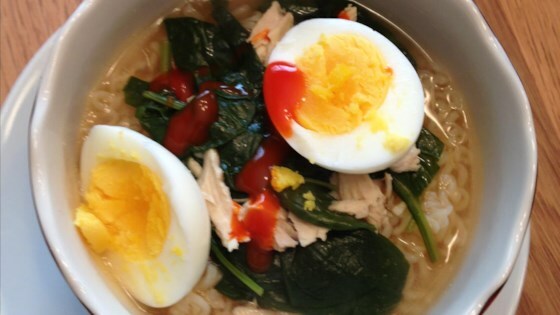 "Start with chicken broth from leftover rotisserie chicken for this easy and tasty ramen soup." Bring a small pot of water to a boil. Reduce heat to low and gently lower eggs into the water. Cook for 8 minutes. Remove eggs from hot water, cool under cold running water, and peel. Combine chicken stock, chicken meat, spinach, soy sauce, sriracha sauce, rice vinegar, garlic, and ginger in a large pot. Simmer until heated through, about 10 minutes. Meanwhile, bring a saucepan of water to a boil. Cook ramen noodles for 3 minutes. Drain. Ladle noodles into bowls and cover with soup. Add 1 soft-boiled egg to each bowl. Garnish soup with seaweed, green onions, chile peppers, and sriracha sauce.